This week’s pick is all about the politics of being pretty in a fairytale world. There are five answers to that. It's a comic book about characters of fairy tales and nursery rhymes coming together under a truce to survive in modern-day New York City. It's a story about a war - both ground war and a war of attrition - between these inhabitants of Fabletown and the overwhelming forces that oppose them. It's a lovingly crafted melodrama (which is not a bad thing) detailing the passions, losses, betrayals and revenges of dozens of characters. It's a story of political intrigue and secrets. And it’s a high-adventure romp across an endless array of vibrant backdrops and colorful enemies. 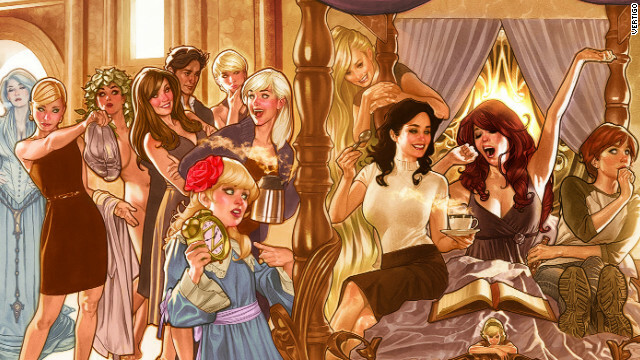 In addition to being an excellent entry point into that world, "Fairest #1" sets itself up as something of a character anthology, featuring a rotating cast of awesome female characters from "Fables." When Vertigo launched “Fables” in 2002, it was not a comic on my pull list. But after more than a hundred issues, a novel, “Peter and Max: A Fables Novel,” three spinoff series (“Jack of Fables,” “1001 Nights of Snowfall” and “Cinderella: From Fabletown with Love,”) and a couple of stand-alone volumes, I can't be skeptical. In fact, I've been in the bag for “Fables” since the end of volume 2 of the paperback collections. Last year, in the wake of news about an unrealized "Fables" TV pilot, two other shows, “Grimm” and “Once Upon A Time” debuted. Here are some of the comics scheduled to hit the shelves on March 7, 2012. Your local retailer will probably have these and others, so make sure to check with them for more details.